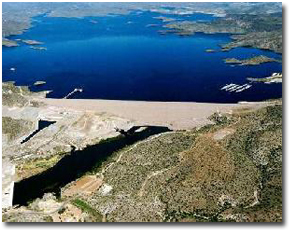 Apache Lake is Formed by Horse Mesa Dam, Apache Lake is long and narrow and is the second largest Salt River Project lake. 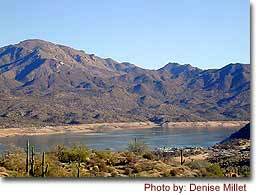 It is located off the Apache Trail (Highway 88) about 65 miles from Phoenix, and is a favorite with many sportsmen, particularly those from southern Arizona. The Apache Lake Marina and Resort is one mile from the main highway and features a motel, gas station, coffee shop, picnic supplies and a trailer park for 12 units. A boat ramp and dock are at the resort, and a county sheriff’s aid station is nearby. The Three Bar Wildlife Area is just across the lake from the resort and provides a scenic spot for photographers. Seven miles northeast of the resort is the Burnt Corral Recreation Site with 17 spaces for trailers which are less than 17 feet long. 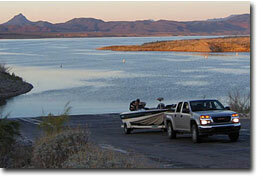 The area is open all year and has boat launching facilities. Game fish in Apache Lake include walleye, largemouth and smallmouth bass, red ear sunfish, bluegill, channel catfish and crappie. 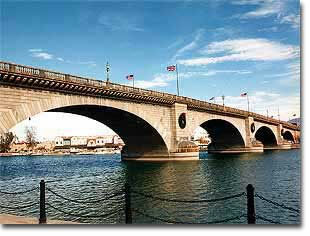 Lake Havasu City h as a well-deserved reputation as a raucous Spring Break destination. In Spring college students fom around the West descend on Lake Havasu to party on the lake by day and in the clubs by night. Lake Havasu City is a thriving tourist town with plenty of lodging, tours, rentals and shopping to support even the largest of Spring Break crowds. Alamo Lake State Park is one of Arizona’s best kept secrets. The stark desert beauty is reflected off the water. Cacti dot the mountainous landscape that surround the lake. 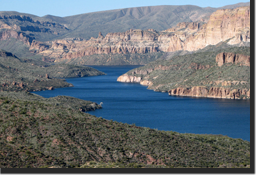 Nestled in the Bill Williams River Valley away from the hustle and bustle of everyday life, Alamo Lake State Park offers outdoor fun, premier bass fishing, rest and relaxation. For nature lovers, spring rains bring an abundance of wild flowers and the lake environment attracts a variety of wildlife year round, including bald and golden eagles, waterfowl, foxes, coyotes, mule deer and wild burros. Stargazers are sure to enjoy the unbelievable view of the night sky with the nearest city lights some forty miles away! Alamo Lake, located on the Bill Williams River where the Big Sandy River and Santa Maria River come together, was created with the completion of Alamo Dam in 1968. The Army Corps of Engineers designed the earthen dam primarily for flood control. During flood events, the lake basin is capable of “capturing” large amounts of water in a relatively short time. The lake has been recorded rising 11 vertical feet in one night! Unusually high flows during the late 1970s and through the 1980s have increased the average size of the lake, helping to create one of Arizona’s best fishing holes.